Lakeside Court. A small communal village environment nestled around the Mabprachan lake in East Pattaya. All properties in the estate are set on generous land portions, so encourage a certain type of neighbourhood, plus the feeling of space, by making sure every house is not intruding on the privacy of the surrounding houses. Inside the property has been well designed, with a nice flow throughout. A well lit living room, a European kitchen with access out to the garden and private swimming pool, plus 3 well sized bedrooms. The owners are selling due to needing to relocate to Bangkok, so have a motivated selling price. 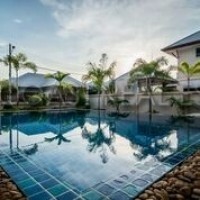 The title deed is held under a Thai company, and this is sold with the house, so purchasing is quick and easy. Also the house is sold to include all the furniture, so again ready to move in with no headaches.